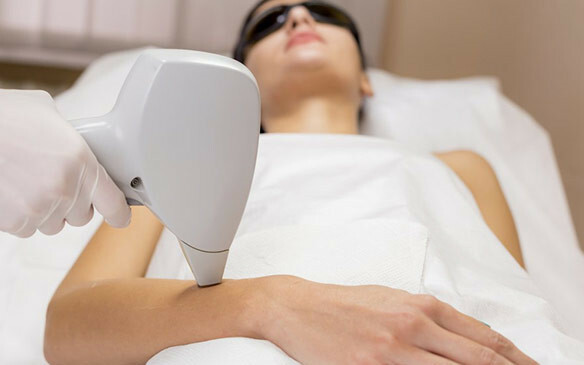 Our US FDA approved Lasers uses a special cooling system that lowers the temperature of skin at the treatment site before, during, and after laser exposure. Therefore, the treatment is generally painless. Some patients describe the treatment like little heat sensation. At any given time, 10-20% of the hair in a particular could be in a growth phase. Therefore, multiple sessions should be scheduled. The number of sessions also depends on the treatment required and the condition of skin. Post laser treatment patients can return to their normal activities immediately. After the treatment, you may experience a slight redness that will resolve within a few hours. In certain instances temporary pigment changes may occur which disappear within a week. Results vary depending on your skin and hair type. Majority of patients can achieve hair reduction of up to 85-90% and remaining hair returns lighter and softer. Please remember to ask your dermatologist during consultation about the Laser machine information like made in which country, technology, US-FDA approvals and skin practitioners certification.